The newest play cafe opened today and parents and children are going to love it! Staffed with a fun-loving team, kids and their caregivers can drop in or reserve a space Monday through Friday, 8 a.m. – 4 p.m. and participate in activities like painting, reading, dancing and other forms of play. A slate of scheduled activities will take place throughout the day. You can expect to see yoga, story time, arts & craft times, music and more. During the visit, adults can relax, get some work done on the free wifi, enjoy a cup of coffee, converse and meet up with other adults, read a book or play along with their children. There’s a fun activities calendar where you plan your visit to correlates with specific activities. I’m most intrigued by the Hot Mess Mom Club that meets on the first Monday of the month at 8am. 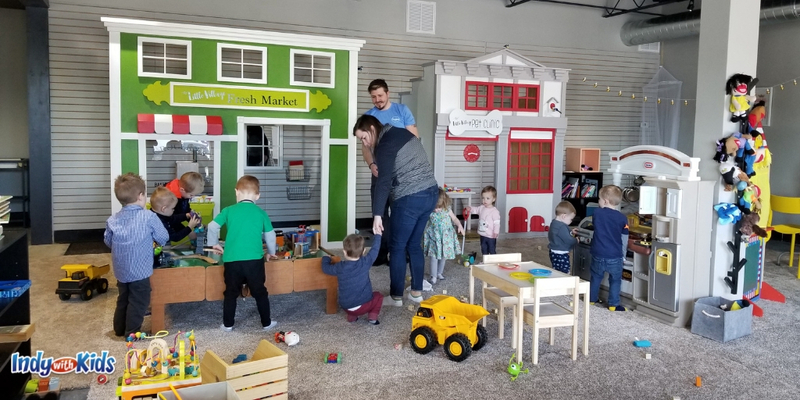 The Little Village Playroom hours are Monday – Friday, 8 a.m. – 4 p.m. On the weekends, The Little Village Playroom is available for children’s birthday parties and private events. This would be an awesome venue for a preschool aged birthday party, lower elementary or even baby’s first birthday! The best way to ensure your spot at The Little Village Playroom is to make a reservation through the online registration system. Much like The Urban Chalkboard, this indoor play space will likely hit capacity during popular non-napping hours, and especially during the first few months as the word gets out. Adult Caregivers can reserve a two hour spot online or drop in (we don’t recommend dropping in with out a reservation right now — the community is going to love this place). You are allowed to bring your own food, snacks and drinks but there is also a cafe to purchase from. What are the Little Village Playroom Admission Prices? Save money when you reserve your spot online. Where is the the Little Village Playroom? The Little Village Playroom address is 9850 N Michigan Rd., Carmel, Indiana. It’s located on the west side of Michigan Road, just north of 98th Street. You’ll find the Little Village Playroom in a storefront one complex away from Jacquie’s Gourmet Cafe. What are the Best Ages for the Little Village Playroom? My children loved this space and played happily for about two and a half hours. The 10 o’clockish story time followed by a craft added just enough structure to their time there and the rest of the time was spent in unstructured playtime. My kiddos are age 2 1/2 and 4 1/2. This space was created with the under 7 years old crowd in mind, especially the preschool aged children. Children who are 8 years old or older are invited to come as “helpers” and will not be charged. See Little Village Playroom website for rules and details. Can I bring my mom group or playgroup here? Groups are welcome at the Little Village Playroom and special group pricing and space reservations are available in advance. The crew at Little Village Playroom are all CPR certified and have an art background. They’re friendly, hospitable and great with kids. The big guide of indoor playgrounds and indoor places to play.